Bring the convenience of storage to your bedroom with the Coventry Panel Door Dresser & Mirror. 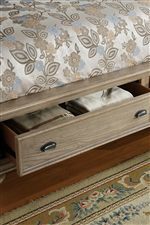 Crafted from hardwood solids and Ash and Oak veneer, the dresser has a solid structure with base levelers and center support. Two paneled doors each enclose adjustable shelving, while five drawers provide plentiful space for tucking away clothing and apparel. 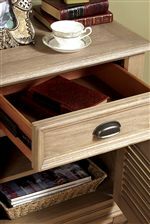 Drawers have dovetail construction with ball-bearing extension guides, and all drawer bottoms are felt-lined, except for the bottom drawer which has a Cedar veneer bottom. 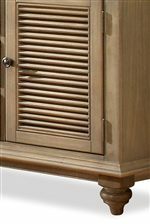 Simple, tip restraining hardware decorates drawer fronts, and small bun feet with shapely turnings lift the dresser and add visual depth to its design. 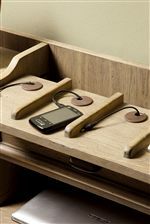 Accompanied is the framed, beveled-edge mirror, which attaches to the dresser with included bolts and two upright support rails. Finished in a rustic Weathered Driftwood, this dresser and mirror set has a charming look and feel and a refreshing simplicity to decorate your master bedroom. The Coventry Panel Door Dresser & Mirror Set by Riverside Furniture at AHFA in the area. Product availability may vary. Contact us for the most current availability on this product. Mirror Framed mirror with beveled edge. Storage Two doors. 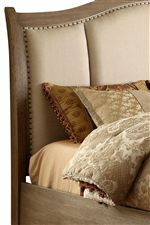 Each door encloses an adjustable shelf. Five drawers with dovetail construction and extension guides. Bottom drawer has a Cedar veneer bottom, all others are felt-lined.